Tossing It Out Tossing It Out: Choosing Sides: Why Do You Fight Your Battles? This is a wishy washy post. In other words I don't want to bring up any specific issues about what I believe or about which I have opinions. We all have some sort of belief and probably most of us have strong opinions about certain specific issues. These beliefs and opinions may concern matters of major consequence to society or they may be irrelevant to most people. The point is that there are matters of disagreement that we all have with someone somewhere. Do we defend our stance on an issue or do we cede to the side with the loudest or most persistent voices? My blog often will present debatable topics that have some degree of controversy. This can be risky when it comes to retaining readers and not sending them off in anger, distaste, or some sense where they feel that my blog does not fit it with what they want to read. I take that chance in the interest of discussion as well as the increase of knowledge and understanding. My greatest desire is to find thoughtful readers who enjoy discussion among those with differing viewpoints. There are, however, certain topics that I do not address here and probably won't because they are such hot-button issues that they will target me from the opposing side causing more flack than I care to deal with as a blogger. I don't have the stamina or heart to take up certain battles. Then there have been a few battles that I have taken on because I felt a confidence that many readers were on my side and my discussing the topics would not create any significant opposition that would overly affect me in an adverse way. I won't name those topics, but I will say that the nature of them has been so absurd in many ways that arguing against them has mostly been an exercise in futility with a bit of debate entertainment thrown in the mix. The blog battles that I have enjoyed the most so far are the Battle of the Bands posts that I do here every 1st and 15th of the month. Otherwise I'm not here to battle any issues in a fierce combative manner that goes on and on. Some topics may crop up more than once and there are some that I may never talk about. I won't name any of them here in this post. Why Do We Pick a Side? 6) Our cultivated morality or lack of morality. 10) What will benefit us individually or the needs of a group with which we affiliate ourselves. What other reasons for decision making when forming opinions can you think of? Do you have causes that you feel strongly enough about to take action for or against? What kinds of causes will you risk taking up even with the knowledge that you might be labeled in some way? Do you avoid discussing your advocacies on your blog or do you tend to be open about your beliefs? Are there any types of opinions that would make you stop reading what a blogger had to say? What causes have you seen taken up that you would consider dumb or frivolous? Hope you can join us tomorrow (Thursday March 20th) at 1 PM and 8 PM Eastern U.S. Time for our weekly Twitter chats. The previous ones have been fun and informational. Topics relevant to the April Challenge are introduced and addressed by A to Z Team members. If you have a question that you've been wondering about, this is a good time to ask. If you've never joined in on a Twitter chat this is a good way to find out what they're all about. Hope to see you there. 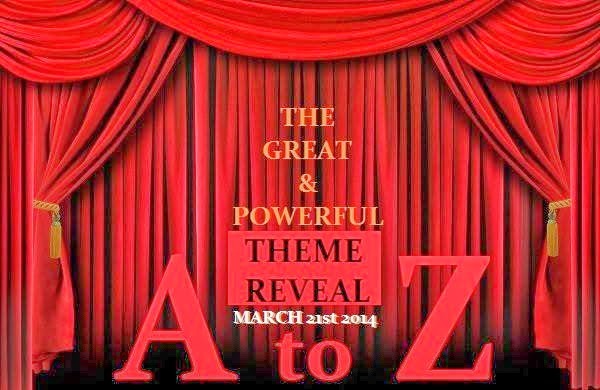 It's not too late to sign up for the A to Z Theme Reveal coming up Friday March 21st. This is the event where you tell us about the theme you've chosen for the Blogging from A to Z 2014 April Challenge. It's a good way to get a head start on the Challenge and let other bloggers get to know you better. If you've already revealed your theme you can still sign up since there are undoubtedly many bloggers who still don't know what you're doing. Introduce yourself and your blog to the A to Z participants. To sign up you can go to A to Z Theme Reveal. If you could give just One #blogging tip, what would it be? I have issues within my family. have done all I could, can't do no more. So I'm going to carry on living my life, otherwise I am wasting much time being upset and worried....not worth it. I do stay away from controversy on my blog but in my personal life I have no trouble speaking my mind and standing up for my values and beliefs. Societal norms seem to be changing, or perhaps we are being told they are. There are certain beliefs I won't mention when writing, or in my blog. I do feel that there is less freedom of speech, and if something becomes law that you disagree with then you feel you have no right to mention it. I feel as if I'm writing in code at the moment! I really try not to talk about religion or politics unless directly asked. Like the meme says, 'your constant FB posts on religion and politics really changed my mind, said no one ever.' The reason I end up voting Democrat in elections is that I don't want to see faith-based laws sneaking in and laws telling women what they can and can't do with their bodies. Everyone's entitled to their own opinions and I have friends who are super conservative and super liberal, and we just avoid hot button issues. We respect that we have differing views. I have gotten into respectful and calm discussions w/ them on FB about issues such as abortion. I find that people don't tend to scream at you if you add a line that says something like, 'not being beligerent or a jerk, just want to know..' or 'just my opinion' with a smiley face. I think that disarms people so they realize that I am not in attack mode or am gonna call them 'idiots' for their beliefs. Anyway, I am going to settle on what causes someone to take a side. You listed 10 things. I would add 1) a strong belief that an injustice is taking place 2) the way we were raised, which may be the way we actually think, or we are just accepting the thought processes of our parents 3)To be liked (I know that this is similar to #5 and #8), but I think many times we choose a side simply because we don't want other people to dislike us. 4) It aligns to our faith. Those are just a few. I think that for MOST people arguing, or disagreeing, is uncomfortable. More so in person than on the internet. Much easier to take a stance with your fingers while no one can see you. I also think that the internet and its forums for throwing bile and hate around make it easier for someone to build up to throwing bile and hate around in person. In other words, the internet is an excellent practice field for throwing out bile and hate on someone. When that ceases to be fun, they are ready for some in person action. I try to stay away from too many sensitive issues on my blog, but I think it's healthy to have an open debate if people can respect others' opinions. I think #6 ends up motivating all the other options there. Excellent points to ponder. I don't like conflict in my life. There is usually some sort of conflict or drama around me, but I don't like it. So I stay away from it wherever I can. Smile. Be Happy. Life is Short. Yvonne -- Life must go on. If others see you enjoying contentment and personal success, they may want to join you. Susan GK-- I think it's easier to express oneself with people who know you well. Fanny -- Yes, code. I think you and I are on the same page. JoJo - Since FB is conversation among "friends" I think it might be an easier platform for expression. I tend to avoid saying too much there as well as on my blogs. Robin -- My post today was purposefully vague and broad just to test some waters I suppose. Your comment was the sort I was looking for. Your added reasons for taking sides are good ones. In certain realms of the internet I think there is a more vituperative approach to presentation. Since I may be using my blog as an author platform I think I want to be more careful since pushing a cause is not my game right now. I don't mind presenting a few causes for discussion, but I'm not looking to go into activism quite yet, if ever. The blog community in which I hang out seems to be for the most part noncommittal about issues and tends to be rather nice and at times almost complacent. I think most are in the same boat as I am about reputation. But it also creates a stale atmosphere at times where few are willing to come out against things they think are wrong or stand up strongly for what they think is right. May be for the best in our case. Sometimes I think we're too busy with our own lives and too settled in to carry a torch to burn down the institutions around us. Talli -- On a blog like yours or mine I think it can be difficult to assess the parameters for having a healthy debate that is really meaningful. If we had blogs that were specifically geared toward issues then in would be different. Of course our audiences would undoubtedly be different as well. Southpaw -- I would agree with you. Our personal moral standard has a lot to do with our alignments and attitudes. Carol-- I prefer to avoid conflict as well and yet I see pervasive forces around us that threaten our peace in the future. I don't know what to do about the encroaching flood if the levee breaks. And if everyone who shares my belief systems does as I do then we are all going to drown. As a people person who loves to interact and hear all sides, I was very sad to find someone close, drop me on FB like a hot potato when I gave my personal opinion. Though I'm not typically thin-skinned and I don't think bloggers and writers can or should be too sensitive--the fact that an old friend gave up on me really hurts. Mostly, I just expect to be in a position about, well, almost everything, that will conflict with what most people think (feel). You can really just stick to #1 on your list, because most people only react strongly to something because they're having an emotional reaction to it. They got their feelings hurt. Or whatever. It's something they would never take a stance for or against until it directly affects them. I tend to have a more reasoned approach to things in that I can answer the "why" when someone says "why do you think that?" and most people can't answer that "why" question. Not in a real way. I'm actually in the middle of dealing with a situation right now where someone had an extreme emotional reaction (I got my feelings hurt.) to something that she was "for"... until it happened to her. How about because the other person is totally wrong??? Desert Rocks- I think this is something to think about if we are in business or trying to promote something that we do that is not related to any kind of agenda. We may be turning off potential customers or those that we already have. If we're willing to take the risk of exposing our beliefs, we must be prepared to face the possible consequences. Andrew - I'm sure feelings play a role to some extent or another in every decision or reaction. Some people are driven by their feelings. That's the group that can be most dangerous to stifling free thought and expression of opinions. I prefer the stance of listening and reasoning and making a decision on what seems to be most logical to me. But I am also strongly influenced by my sense of morality which sometimes doesn't appear to lead to the most logical choices until I start thinking more deeply and exploring consequences. It can get pretty sticky to be in the situation like you're in--I've been there too. Jo -- Right and wrong are matters of opinion and that becomes the biggest source of conflict. Not many people who are wrong want to admit that if they are firmly entrenched in believing they are right. To bad we don't have more clarity, but people believe in so many different things. Whether we agree with each other or not. Everyone has a right to their own opinions. We fight the battles we fight because whatever the reason, we believe they are worth fighting for. Or at least taking more than a quick skim over. Lee, do check my blog tomorrow, Thursday, I have posted a cartoon particularly for you. My blog is (mainly) about writing so I don't worry too much about controversy. Writers tend to have strong opinions, though so maybe my small number of followers keep me from being bombarded when expressing my beliefs. Maybe that is one of the few pluses of being unknown. >>... What kinds of causes will you risk taking up even with the knowledge that you might be labeled in some way? None. I try to get along with EVERYONE. In order to do that, you can't risk rufflin' feathers. As Homer Simpson once said to his son, Bart: Being popular is just about the most important thing in the world. I believe that, and it's something I always try to live up to. How could you have a blog post on cat fighting? Even worse, you are apparently operating an illegal kitten fighting ring! Funny timing on this topic, as I'd just gone back and forth with one brother on health care reform, and his replies leaned more towards pontification than idea exchange. I have not replied to his last message, which really seemed to have a condescending and insulting tone, as I am deciding whether it is worth the effort. It is a little easier to avoid family conflict when you live far away-while my initial reaction when I read his message was unprintable, it's too easy to just use the delete key rather than get caught up in a pointless argument. What's the old saying? I refuse to have a battle of wits with an unarmed man! Of course, if I have to rely on my wits, I am halfway there! What I had to say on this topic was SO IMPORTANT that I felt I ought to say it twice. Sheena-Kay -- But what about those who won't stand up for what they believe? Jo-- Thank you. I'll check it out. Jennifer -- That's one way of looking at being inconspicuous. StMc -- I guess there might tactful ways to ruffle feathers. Or you can just put a tack on a chair that someone's about to sit on and just wait to have a good laugh. Larry -- I couldn't resist the cat photo. Not something you will often see on this blog. Family conflict is among the worst. It can cause divides among those you usually want to stay close to. But then again I guess not all families want to be close. I try to be witty when I can, but some people just don't know how to have fun. StMc -- Well I got out the ol' bug spray and took care of things. And now your postscript comment makes no sense. We half wits have to stay together. United we might create chaos in the land of the opposition. Angela -- I still like to stir things up a bit by playing devil's advocate. It livens up the discussion and makes what seems to be settled unsettling. I try to avoid fights, we are all different and have different points of view. I believe in equality and a believe that all folk should have the opportunity to have there say but not at the expense of others. Once someone suppresses the freedoms and beliefs of others I am not happy and have been known to stand up and be counted, but I tend to need a nudge. After all I did once leap daringly into a runaway truck to stop it. Wow- lots of brave people out here. I tend to be one who is actually less vocal in real life, and more vocal on my blog. I write to process my thoughts (scary, I know) and that can get messy. One of my goals this year is to get to where I can just be authentic me without worrying over what others think.... so several of your list items resonated with me. Rob -- The runaway truck is a good analogy to describe what entering into a debate conflict can be like. Julie -- Authentic is good I think. I see a lot of agreement in comments sometimes that doesn't seem to correspond with how I perceive the blogger who left it. Some blog is so trivial and light as to be cloying. But that's what some people like. Usually I'll keep my opinion to myself or figure out how to deliver it nicely. I try not to touch on hot button topics in my blog, but I will express my own beliefs when I think it's appropriate. The only thing I can think of that would make me drop someone else's blog would be if they presented their views in a way that was mean or hurtful to others. All I can say is pick your battles carefully, especially if someone has to win and/or lose. Integrity matters, so I don't believe in arguing for the sole sake of arguing. I will however stand my ground, and argue as much as necessary, if it's something worth fighting for. Elsie - Sometimes a religious or political conviction may call for trying to reach out to others to sway them, but I know that tired feeling often. Fighting battles of persuasion can make one weary. Shelly -- If you can deliver an opinion nicely that's a good way to do it. I may sometimes try the veiled approach. In a sense I've done that in this post. LD -- I enjoy hearing rational discussions about views, but not attacks on my own. MJ-- I don't mind arguing in a sporting debate sort of banter, but I don't want to become marked in such a way that my integrity is sullied as is anything that is connected with me. As a rule, I rarely touch hot button topics on my blog. It's not that I don't want to, but it has a tendency to drive people away from my blog. However, I actively search them out on FB (which has cost me a few friends over the years). At the moment, my current beef is the bullying done by the LGBT community in regards to gay rights and gay marriage. It's a very lonely existence when you try to be the voice of reason in a world of vitriolic double standards. GB -- Controversy is a sticky thing to handle on a blog and has to be handled in the right way to avoid losing readers. I may have lost some along the way, but I like to keep some interesting topics going. It's difficult to make reason be heard over the screaming of those outshouting with their feelings. I think for some of us, we live for the thrill of adversity. Picking a side can encompass a jousting play of wit or friendly banter. As was implied in your blog, picking your battles is essential. 6, 7, 9, and 10, primarily. I dislike confrontation and aggression, but I don't back down when I'm backed up by righteous indignation. Someone's got to be brave enough to stand up and speak out - why not me? That said, I don't enjoy arguing with walls and obstinately close-minded people. It's pointless, unless it helps the quiet or fearful bystanders to crystalize their own thoughts on an issue. Christina -- I don't think it's always essential to pick our battles just the ones that deeply mean something to us. Intellectual rational explorations of an issue can be good for us. Holly -- A lot depends on where I am, who I'm around, and the consequences of my defense of an issue. Wasting energy is tiresome and usually just results in creating bad vibes among others. I hear ya. I'm willing to risk "bad vibes" to defend or champion certain things, like human rights. If it emboldens others to do the same, it's time well spent.